And now this late-breaking important message from Martin Rogers of Yahoo Sports!!! 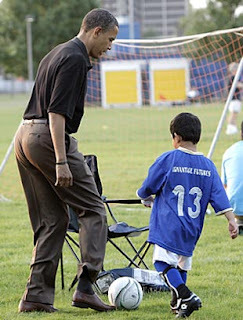 The election of Barack Obama might lead to U.S. hosting the World Cup in 14 years. Yes, really!!!! Now, to actual sporting news....the only way this Matt Holliday to Oakland trade makes any sense is if Billy Beane is turning him around to trade by the trade deadline. Holliday has made it clear he's hitting the market when his contract done at the end of next season. And no way Oakland can afford him. So, a year after Oakland trades away the house, with Blanton, Haren and Swisher all leaving, he turns around and trades some of his kids for Holliday, who's sure to leave? Nah....Beane is using him to get more kids at the trading deadline. Kudos to the Eagles for keeping McNabb upright all game—no sacks for the Giants defense. Nice...except for the fact that the Giants kept the ball for 40 minutes of the game, meaning their defense was only on the field for 20 minutes. How about this trade? Robinson Cano, Ian Kennedy, Kei Igawa for Chad Billingley and Matt Kemp and Anduw Jones? Makes sense to me. Here's why. First off, Cano needs tough love, and with his former coach, Larry Bowa there, I would look for Cano to regain his All-Star form. And besides, Jeff Kent is, like 4000 years old. Ian Kennedy will appreciate the National League and the bigger park—scouts still say he has the make-up to be a top pitcher. The same could be said for Kei Igawa who pitched very well in AAA this season, striking out 117 in 156.1 innings to the tune of 1.19 WHIP. The National League would suit him well and I wouldn't be surprised if he actually becomes something of a minor force out in the NL West (remember, the Dodgers face the light-hitting D-Backs, Padres and Giants a bunch of times). For the Yankees, Chad Billingley speaks for itself. Saying the Yanks need a young pitcher is like saying Popeye needs spinach. Matt Kemp could solidify the CF question nicely, pushing Brett Gardner and Melky Cabrera to 4th OF/trade bait status. And taking Andruw Jones off the Dodgers hands, financially-speaking, would be the spice on the deal for the Dodgers. They could then turn around and use the 15 million to go sign Manny to play left field. And who knows? If Jones actually wakes up from his 2-year coma, so much the better for the Yankees. I like the deal. Now, only if they would do it. Profootball Weekly has a nice article, the 10 most interesting free agents of 2009. For my money, number 7 is the most interesting; T.J. Houshmandzadeh. No doubt he leaves the mental asylum that is Bengal-land for any amount of money he can get. But when you consider he had 202 catches in 2006 and 2007, and already has 61 this season—thrown mostly by Ryan Fitzpatrick, not Carson Palmer—you know some team out there is going to show him and his soft hands, some major love. Don't look now, but the Jets have won 4 out of their past 5. Super, but the next two games are against the patriots and then the Titans, both on the road. Oooof. 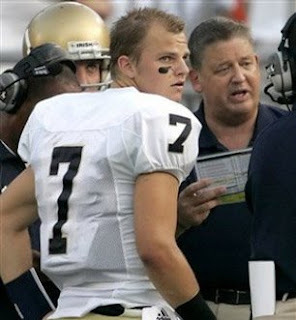 I know he's the top recruit from a few years ago, and he's only a sophomore and has more growing to do....that said....every time I see Notre Dame's QB, Jimmy Clausen, I am overwhelmingly underwhelmed. Yes, Boston College's defense was awesome on Saturday night, but 9 completions in 22 attempts. 4 interceptions? 0 points? Hope for Big Weis that he gets a lot better a lot sooner than later. This week's Andaplayertobenamedlater's Man of the Week award goes to none other than Kerry Collins. Coming into the season as a backup for fomer Golden Child, Vince Young, Collins has done nothing less than lead the Titans to a 9-0 record. And this past weekend, when the Bears shut down Titans RBs, White, Johnson and co. to just 20 yards on 29 carries, Collins went out and passed 30 for 41, 2 TDs and no interceptions. Congrats Kerry on keeping the Titans loss-less. And finally, in case you haven't seen it, check out this sick punt return by Will Blackmon (former BC guy) of the Packers. Not only that, but it's the second time he's done that to the Vikings this year. Amazing. Dude is like a pinball.